With the current tensions between India and Pakistan starting from the Pulwama attack on the 14th of February, 2019 when 42 CRPF jawans were killed in Pulwama, Jammu and Kashmir till the release of Wing Commander Abhinandan Varthaman who was captured by Pakistani Army men, a lot of fake news have gone viral on social media platforms. We have a few examples with us. 1. This video of a Pakistani Air Force pilot on an F16 jet who had allegedly violated Indian airspace. This video shows a Pakistani Air Force pilot who allegedly targetted an Indian jet from an F-16 fighter jet used by the Pakistani Army. This post has been widely shared by social media users in Pakistan. This post by Azaz Syed, a Pakistan based author has got 605 retweets. 2. Pakistani media sharing images of crashed Indian fighter jets shooting down an Indian jet, Pakistan Media was flooded with fake images. 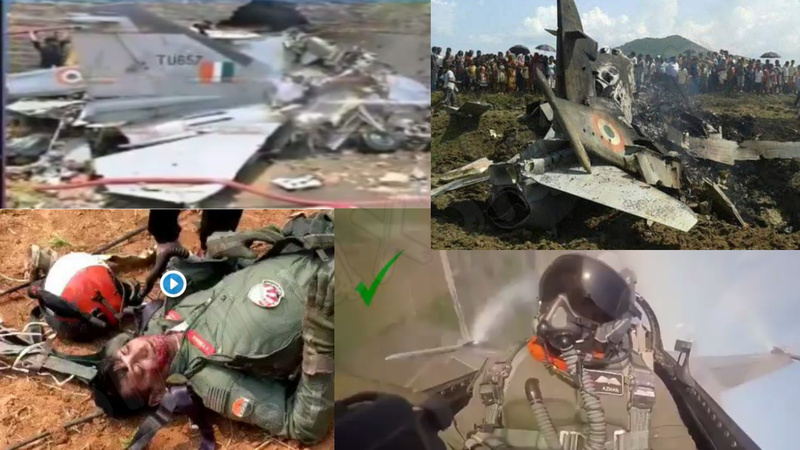 Although the images are true, bot these images date back to articles reported on Indian jet crashes in Odisha’s Mayurbhanj and Rajasthan’s Jaisalmer. SMHoaxSlayer has already busted this news. SM HaxSlayer has debunked bot these fake news before. This fake image shared by The Express Tribune in Pakistan with 450 retweets is actually of a 2016 jet crash in Odisha’s Mayurbhanj District. You can also refer to this article for more details. 3. Is this person Abhinandan Varthaman? Pakistani Media has circulated this video of an injured Indian Air Force pilot, claiming him to be Abhinandan Varthama, who was caught by the Pakistani Army, and later released. Pakistani Journalist Shahid Masood shared this video, which has got 3566 retweets. This video is actually of VT Shelke, a pilot who was injured after the infamous Yelahanka air crash in Bengaluru, after two Surya Kiran jets collided into each other while practicing for stunts for the Bengaluru Aero India Show. #IndianAirForce never release their #airstrike videos on #WhatsApp which you might have received by now. Most of them are false, and if real, the point arise, where did they get classified video from ? Security breach ? So do not forward them without verifying. ← ‘Now’ is actually ‘Then’. Old photo of river Ganga has Priyanka Gandhi added digitally in it. People’s Laziness and speed of Fake News !